In order to run a successful business via a WordPress website, you need to keep your visitors interested and engaged at all costs. While the quality of your content plays an essential role, it is also crucial for your audience to be able to easily navigate your website. You might be asking yourself – how do I get my visitors to read more of my content? The answer is simple – it lies in taking into consideration related post links that are incorporated into your pages. Lucky for you, the WordPress community has been asking the same questions, so they have come up with great related posts WordPress Plugins that are at your disposal. In this article, we are going to overview some of the best-related post plugins out there, which you should give a shot. Jetpack is a plugin that offers a wide variety of features and an excellent related posts module. What it does is that, if your blog contains more than 10 posts, it analyzes the content, categories, and tags with the goal to pick the most relevant posts that it should link to. There is an abundance of customization options, such as placing the related posts on top of the article rather than the bottom or setting the number of posts that are to be shown. You can also exclude posts and whole categories from being displayed. On the upside, the team behind Jetpack takes its security features very seriously, and the advanced functions really make it an exceptional plugin. However, on the downside, it is a somewhat slow plugin, but you can fix that but turning off modules that you don’t need. No matter how Yet Another Related Posts Plugin sounds, it does more than you may think. It gives you quite a lot of flexibility with pages and custom post types. You can link to the relevant posts in the sidebar next to doing so at the bottom of the page. YARRP offers a sophisticated algorithm that analyzes content, titles, categories and tags. The premium version of the plugin offers you even more advanced features and functionalities. With the upside of a great number of features bringing it a lot of popularity, it comes with the downside of being quite resource-intensive. This is the reason that it’s blacklisted by WordPress hosting services like Media Temple and WP Engine. Contextual Related Posts is a robust plugin that offers a lot of features. You can use a shortcode to put your related post links in an article that you choose, or place them in a sidebar widget. It allows you to incorporate an excerpt from your article right below your thumbnail image, by setting the number of characters that you want to be displayed. The custom CSS enables you to customize the related posts anyway that you like. It’s excellent customization features make this plugin really stand out. It is also great that you can choose the number of posts that you want to show, and exclude posts that are irrelevant. However, the problem with this plugin is similar to YARPP’s – it’s very database-intensive and therefore blacklisted by some hosting services. Yuzo Related Posts is a neat plugin for keeping your visitors engaged and interested long enough, without slowing down other functions in the process. Furthermore, it offers a variety of features that you can benefit from. It’s extremely fast and is very flexible in enabling you to pick which related posts you want your visitors to see. Its design is lovingly minimalist and has some really great effects, a visit counter, and the ability for text, background color, and thumbnail customization. You can also choose whether your posts are going to be listed vertically or horizontally. The upside of this plugin is that its setup and use are quite simple. The downside is that it’s not as lightweight as you’d think such a quick plugin would be. In comparison to Yuzo Related Posts and other previously mentioned plugins in this article, WordPress Related Posts is pretty lightweight. What makes it stand out is built-in caching. The related posts feature is incorporated into your footer, and you can decide which of your older posts you want to be shown. Even more than that, you can choose posts from other people in the user-network of this plugin to be displayed. You can restyle your posts and thumbnails, and make use of a great number of other customization options. While the upside of this plugin is that it won’t slow down your websites, it does lack some of the functions that other plugins have to offer. If you’re looking for an extensive variety of functions, then you should look elsewhere. Inline Related Posts is a great plugin that automatically incorporates related posts into a widget box. It does a great job of catching the eye of your visitors, boosting the number of times related content is visited. It offers you customization options, with more than 20 styles that allow you to choose from various theme and color schemes. 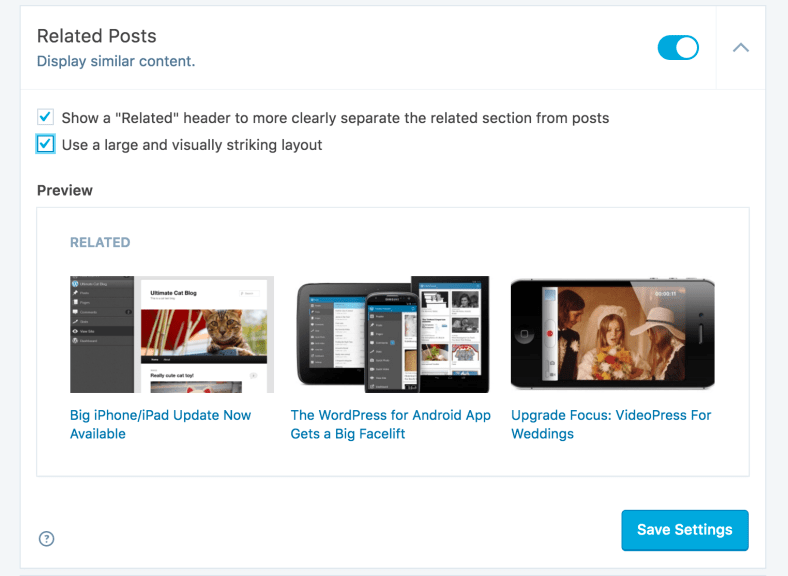 While it is great that the plugin displays the content in a way that is quite visible to your audience, the downside is that you can’t show your related posts at the bottom of your content, even though this is very appropriate for some types of posts. Content.ad is a popular plugin with a variety of features. There is a lot of customization options, and the great thing is that the content is shown well even on mobile devices. Furthermore, it supports revenue sharing. It is a plugin that is really easy to install, but it does require of you to sign up for an account in order to use it. The good news is that the account is free, and the same goes for the support if you run into a problem when using it. There are many benefits to using a quality related post plugin, as it improves your overall SEO efforts, such as time on website, page views and bounce rate. It’s also the perfect solution for bringing some of your old posts back to life. Try these 7 related post plugins out, and decide which one suits your needs the best. Author bio: Sam Cyrus is CEO and co-founder of agseosydney.com.au, a Digital Marketing agency from Australia. Sam is also a creative writer and likes to share his insights on entrepreneurship, business, online marketing, SEO and social media. He currently collaborates with Nirmal Web Developer Sydney.